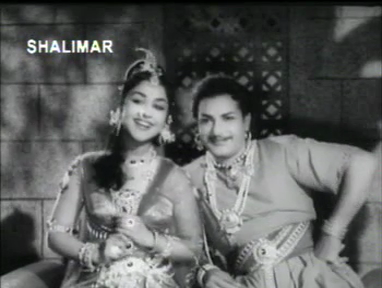 Jagadeka Veeruni Katha (1961) is a sumptuous fantasy drama directed and produced by K.V Reddy. It stars NTR with B Saroja Devi, L Vijayalakshmi, Jayanthi and Bala as the love interests, is loaded with songs and is beautiful to look at. It’s also around 3 hours long, clearly made for a time when a more meandering pace was appreciated. The plot can be loosely described as follows. 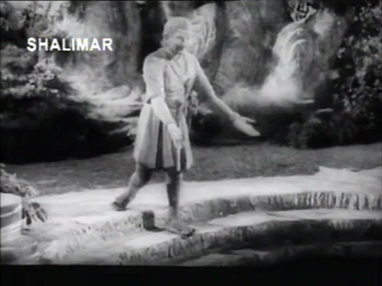 Prince Pratap (NTR) defies his parents and leaves the kingdom in search of love. His dream women are the devakanyas who represent the elements of Air, Water, Fire and…Snakes. 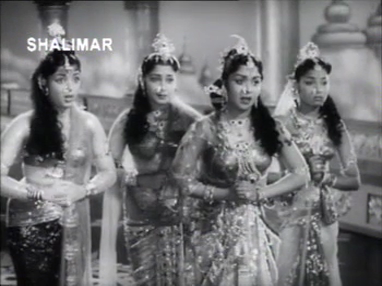 Indra Kumari (B Saroja Devi), Nagini (L Vijayalakshmi), Varuna Kumari (Jayanthi) and Agni Kumari (Bala) like to bathe in a decorative pond, gossiping and singing the day away. 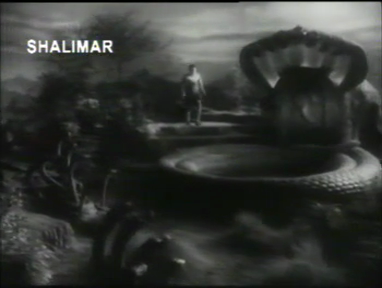 Pratap finds them, but in return for his unwanted attention Indra Kumari turns him into a statue. Pratap’s mother goes into devotional overdrive and Parvathi (Kannamba) answers her plea. 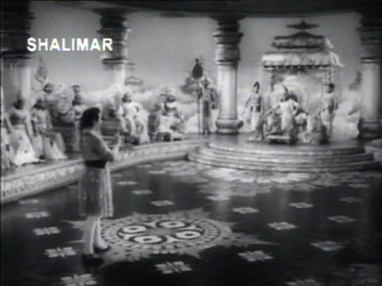 Pratap is restored to his princely self and Parvathi gives him the tip-off that if he stole Indra Kumari’s clothes, she would be stranded on earth and have to marry him. Marriage duly accomplished, he sets off with new wife and newly acquired best friend Rendu Chintalu (Relangi) to a neighbouring kingdom. 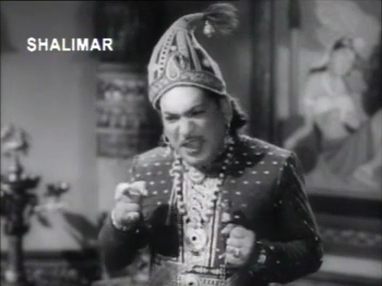 Threesokanadu (Rajanala Kaleswara Rao) is a petulant brat of a ruler and wants whatever he can’t have, including Indra Kumari. Devising numerous ploys to send her husband off on missions to Nagalokam and elsewhere, all he succeeds in is getting the remaining devakanyas hitched to Pratap. I don’t know why he thought dressing in a saree would help his cause. 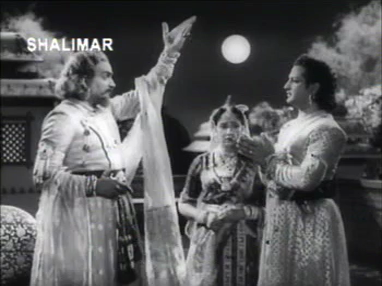 Relangi and Ekasa (Girija) have a comedy subplot in which they thwart the king’s plans and generally bicker. 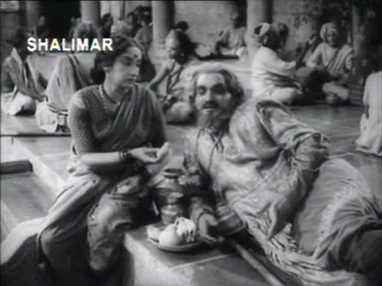 Meanwhile, back in Pratap’s home his brother has conspired to overthrow the Maharaju and Maharani (Mukkamala Krishnamurthy and Rushyendramani), who are now living on the streets. Eventually they get wind of Pratap’s whereabouts and a tearful reunion is on the cards. 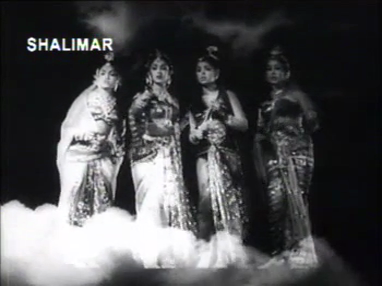 The devakanyas trick their mother-in-law and get Indra Kumari’s saree back and leave for the heavens. 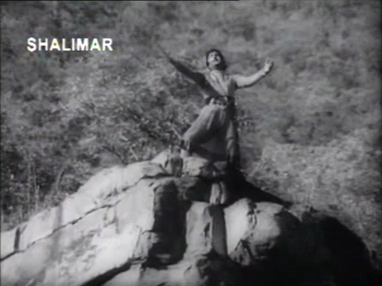 Pratap goes wild with grief and the ladies seem to miss him too. Indra and the other lords of various heavens test Pratap and eventually he gets his wives back. Happy days. 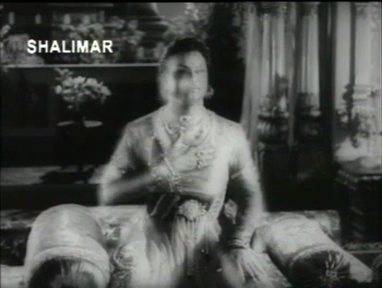 It’s NTR’s film from go to whoa and he could do this kind of role in his sleep. Pratap is the perfect prince and goes from swooning to swashbuckling in the blink of an eye. 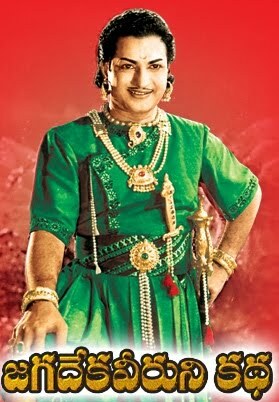 He gets all the big speeches and a couple of key songs, and NTR dominates all his scenes. He always has a nice rapport with Relangi, and I liked them together as they showed the more human side of Pratap with a bit of humour. Relangi’s character gets to do some useful and sensible things in amongst all his comedy bumbling too. B Saroja Devi is the leading lady and does get the majority of screen time, but her character is not really developed beyond being designated as a heavenly beauty. The warmth in her interactions with the other devakanyas, and her chemistry with NTR is largely drawn from her own performance and not the script as far as I could tell. 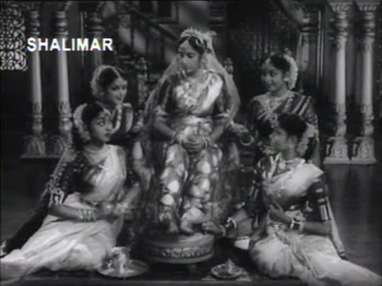 One of my favourite filmi dancers L Vijayalakshmi gets a little bit of dialogue and a few not very snakey dances, but the other wives are not given a lot to do in the story. They all look stunning in their sparkly costumes, and I found their scenes together more lively than the ones where they had to stand around simpering at Pratap. Given the heavenly origins of the leading ladies and the divine interference by Parvathi, there is lots of scope for special effects and magical plot developments. The devakanyas all have distinctive modes of arriving at their bathing spot. Nagini turns into a snake when her mood sours. And faced with the demands of multiple wives, Pratap is magically cloned so he can spend quality time with his spouses. Comedy demons perform a range of useful services, including transforming into a flying divan. 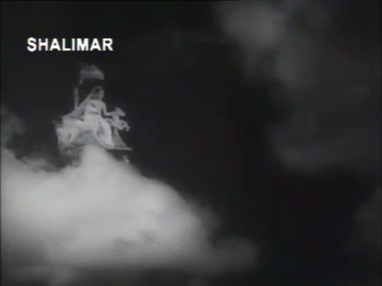 Pratap is changed at different times into a statue and a baby. Aside from Marcus Bartley’s stunning camerawork with his trademark moonlit scenes, I was struck yet again by the skilful use of the limited 1960s technology to create some really effective illusions. There’s nothing that would fool today’s CGI savvy audience, but the sequences are creative and are perfect for the fable of a prince on a quest. Except maybe not the rag doll dummy used in some fight scenes. 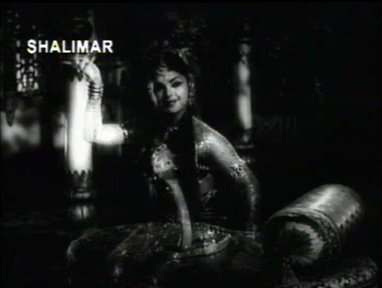 The music by Pendyala Nageswara Rao is lovely and it feels like someone breaks into song every few minutes. 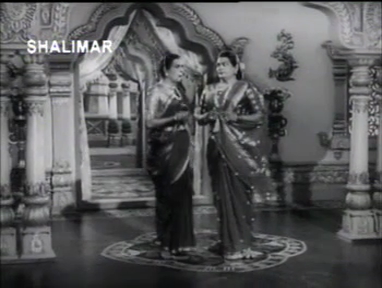 The only character who does much by way of dancing is L Vijayalakshmi as Nagini. 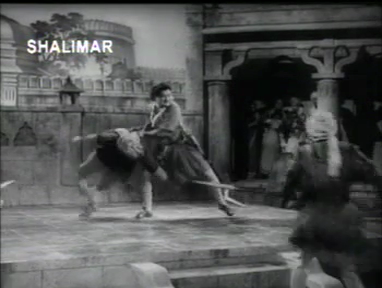 When Pratap arrives in her kingdom, this is how he is greeted. 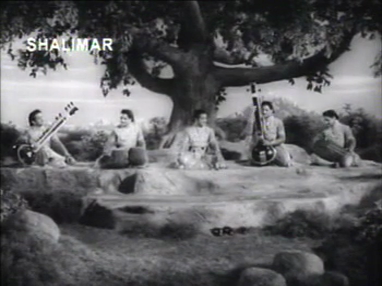 And there are some lovely duets as well as more devotional songs. 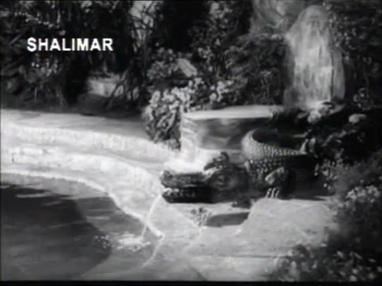 The set design is lavish with all the intricate decorative motifs I’ve come to expect from this era and genre, including fabulous animal themed furniture and fittings. Plus some excellent work from the hat department. The film is available without subs on YouTube. I’ve also managed to track down an unsubtitled VCD, but the picture quality is poor. I can only imagine what it might have been like with a decent print and sound. 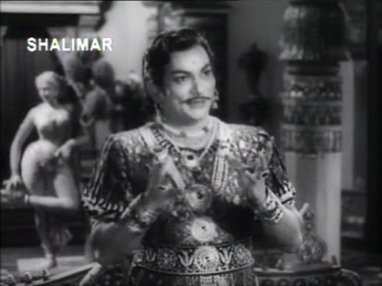 Really Telugu film industry – get your act together and do something about these classics! 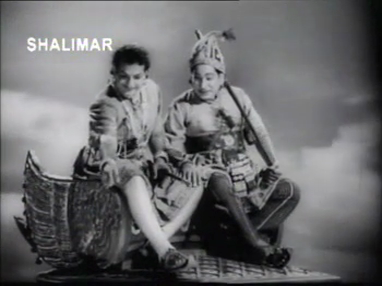 This entry was posted in Tollywood and tagged Adventures without subtitles, B. Saroja Devi, Bala, Classics, Jayanthi, K.V Reddy, L Vijayalakshmi, Marcus Bartley, Mukkamala Krishnamurthy, NTR, Pendyala Nageshwara Rao, Rajanala Kaleswara Rao, Relangi, Rushyendramani, Telugu. Bookmark the permalink.